Underneath lies stored Chromium 6, a carcinogen that officials say will be contained when builders are allowed to penetrate the cap. Baltimore may be the first city in the country to knowingly puncture a capped chromium dump in order to build a 23 story tower, making city folks either guinea pigs or participants in a pioneering remidation project, depending on your perspective. If it works then the nation’s developers will suddenly have a way to build heavy on what was seen as taboo territory, highly toxic brown fields such as the 25 acre Allied Signal Chromium site on the Harbor. But if it fails the city, the Maryland Department of Environment and the EPA would have willingly broken open the cap designed to protect the public from hexavalent chromium or Chromium 6, an officially recognized carcinogen. And that public has gotten increasingly crowded around this site as the city’s waterfront has been built up since the cap was completed in the early 1990s with corporate headquarters, condominiums and a high end shopping district, Inner Harbor East pressing on all sides. 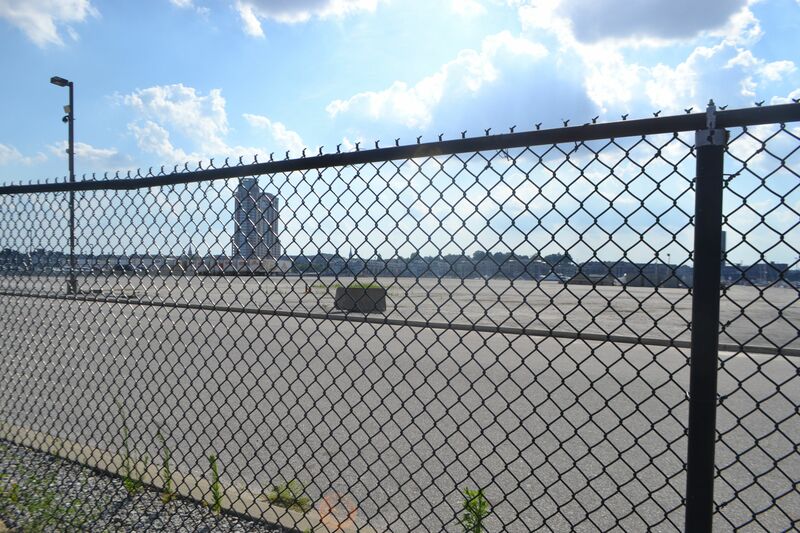 Dubbed Harbor Point, the proposed development comes in at $1 billions for the Exelon Headquarters and has generated much rumbling from City Councilman Carl Stokes after a last minute proposal asks for 108 million in bond advance to draw investors. Harbor Point sits on a political fault line that could draw diverse interest from civil rights advocates angered that developers are utilizing incentives but giving nothing and environmentalists to whatever is left of the Occupy Movement, but Baltimore’s street politics is a pretty tepid place to be sure. The project, under the aspices of developer Michael S. Beatty’s Harbor Point Development Group LLC, with 9 acres of green space, is a far cry from the original perceptions of relatively low impact develoment and more than 11 acres of development. 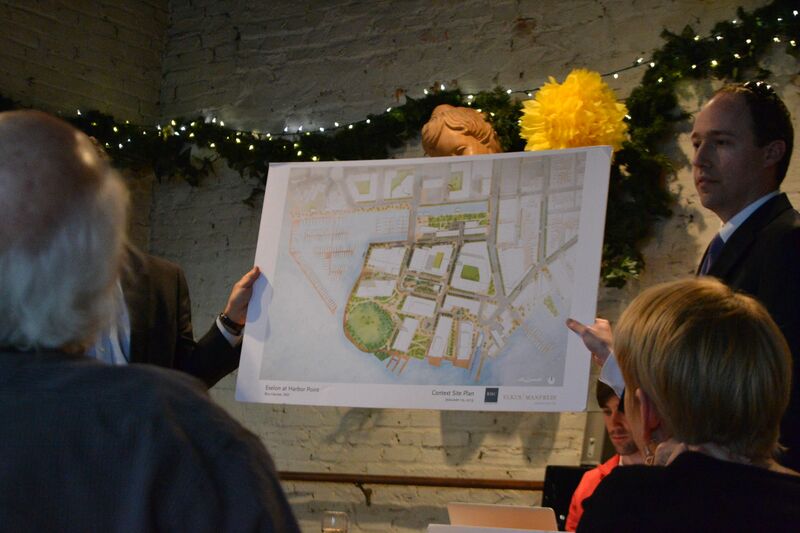 But Baltimore may be breaking ground in more ways than one. Baltimore’s distinction as a trailblazer or guinea pig, depending on your perspective, has yet to be varrified,but that hasn’t gone without trying. For the last several months I have gone to the EPA as a citizen, a resident who lives two blocks asking if there is an example of any development of this size that has been completed on an urban toxic site. They have offered none. In the meantime I’ve searched libraries and the internet for development protocols such as exist for say lead paint removal, detailing how can builders send 27 foot pilings safely into a clay cap and found nothing. I had a chance to ask representatives of the developers of the proposed new home for the new Exelon Headquarters, The Beatty Group. He said that the pilings will have a point that would reduce any dust. Just how the pillions will be inserted into a toxic site without disturbing the containment system that prevents groundwater contamination that remains to be seen. EPA officials assured that strict monitors will be in place and although the developers have gotten preliminary approval, the procedure of how the site will be development has yet to get final approval. But that doesn’t fill me with confidence especially since Baltimore seems to be set up as a test case. In fact in Jersey City, which was facing a similar chromium site, owned by Honeywell, the same company charged with overseeing the Allied site, the contents of the toxic dump was removed. That is in Jersey, there is no issue of buiding on or penetrating a cap because the chromium was shipped off to an already established toxic waste site. Of course the removal only occurred after a law suite forced New Jersey’s government to remove the site. Known as the former Rosevelt Drive-in, the site encompassed 30 acres of chromium and slag. The slag would pop up or heave from the chromium underneath, according to reports in the New York TImes. Concerns were both about air-born contamination as well as groundwater. “I very much believe in economic development, but I want it done in a way that’s safe,” Mr. Ashley says that allowing developers to cap a site, build housing on it which serves as a cap, is asimilar to description put forth by the Baltimore group and Maryland Department of The Environment officials. He said dubbing the development as a working cap is what environmentalists call “pave and wave” and just postpones the problems. He wanted all the hazardous waste removed. In 2003, a federal court found that the way chromium waste heaved under the slag made capping impossible and ordered the contaminants, a half million tons worth, removed. That didn’t stop Honeywell from appealing the decision, coming up with a containment solution to prevent the slag from heaving. According to the New York Times article, they said ground water was making the chromium bond together pushing up against the surface. In the end the courts were not buying it and ordered Honeywell to remove all the chromium (see link to law suit). And yet in Baltimore right in the middle of the City’s gold coast, with Harbor East on one side, Fells Point on the other and Inner Harbor to the West and Tide Point and Federal Hill to the South, that’s exactly what we get. We get the very toxic site that the courts in New Jersey found unacceptable. The question is why did Baltimore which was hammering out a remedial plan with Honeywell in 1989, allow a toxic waste dump to be built on such prime real estate, a peninsula in the Harbor. 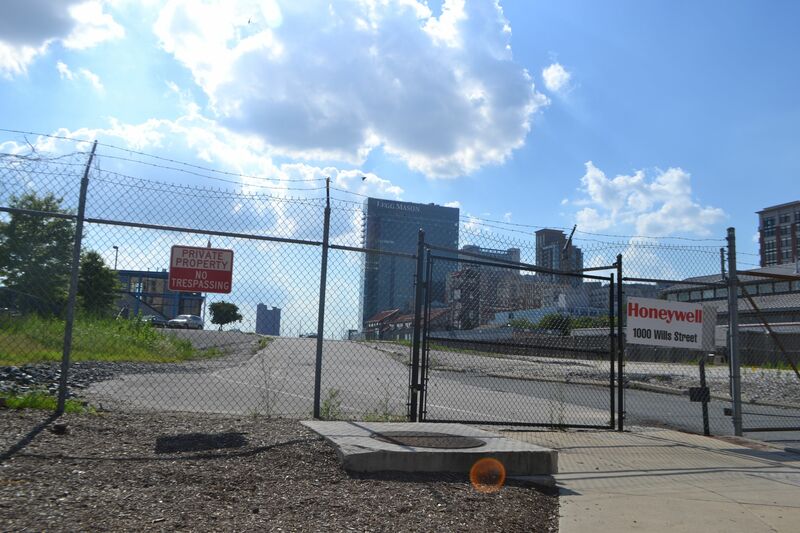 A law suite forced Honeywell to remove Chromium to make way for development in Jersey City, but in Baltimore the same company was allowed to cap the waste, a process that was rejected in Jersey Courts. Thus far in Baltimore, the environmental concern is at best on the fringe of public discussion. While many talk about the promise, the jobs, the risk of doing what amounts to be exploratory surgery in the cap of a chromium six is getting scant public airing and no talk of the risks. After all this jabbering about sustainable economy — buy local, support urban farming, rediscover craft industry — a group is putting money where the big ideas are. They have created a local currency — The B-note to be more specific, legal tender that functions in same way the good ole greenback works, passing bucks from one hand to the next, except for one thing. The B-note stays in B-More Not true with the dollar, which is at the whim of the big spender who could buy a beer for the house at the corner bar or plunk some cash on an overpriced pair of sunglasses guaranteeing that the money zips out to some corporate headquarters. 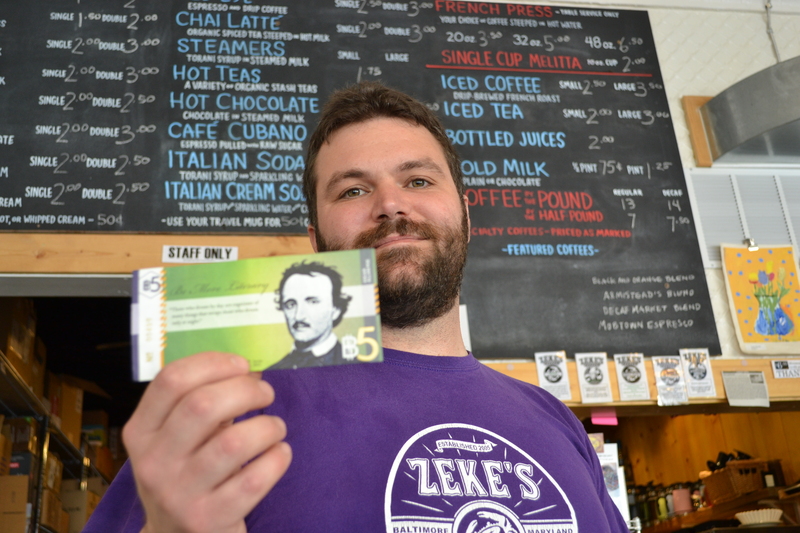 “The whole purpose of this is to benefit the small independent businesses, to get people thinking about where they spend their money,” said Jeff Dicken, a member of Baltimore Green Currency Association, the group behind the currency project. The idea was in the making for a year, as the group planned the distribution, designed the 1 and 5 B notes and raised about $8,000 to print 100,000 Bs of tender. 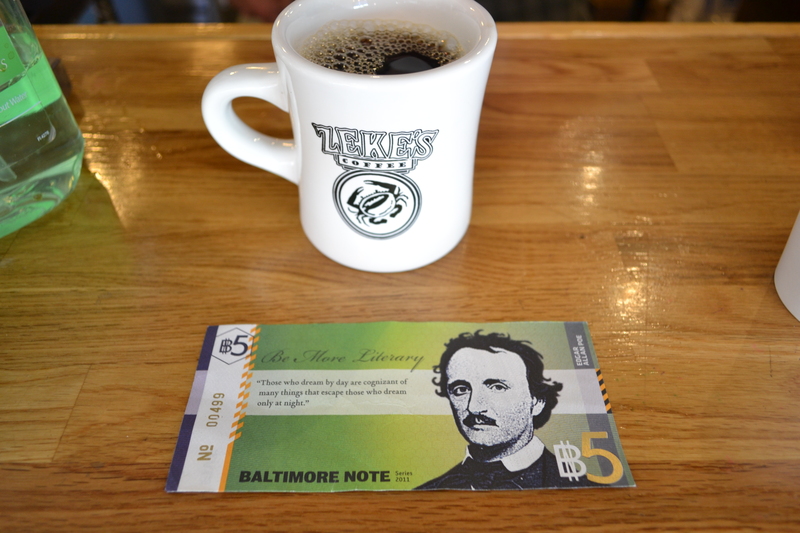 The B-note hit the streets three weeks ago and is now being accepted by 64 business citywide all listed on Baltimoregreencurrency.com. The acceptance is far larger than the currency architects imagined. Dicken said he had hoped that maybe they’d recruit 30 to 50 businesses in a year’s time. Now they’re looking to cap 100 business by the end of the summer. The local currency movement basically enforces the buy local cred. That is the B-note is worthless (so far) unless spent in the community in Baltimore, forcing the consumer to think or search out where they can plunk down their B-Buck. Damien Nichols, one of the organizers, found that explaining the mechanism is behind the currency can be difficult, but Baltimore with its tight network of indigenous business understands the power of buying local. “You’re surround the community with a fence and all the energy and the money stays here,” said Nichols. The idea is that people can exchange dollars for B-Notes at an exchange rate of 90 cents on a dollar or ten dollars for 11 B-notes. So the purchase incentive is built in. Secondly the Baltimore Green Currency worked to set up a lateral economy where businesses buy goods and services from each other such as a store owner can get graphic from a designer, who have agreed to accept the notes, rather than just have a group of stores, a shoping center. Whats more no one stands to profit from the currency. There is no cut. Baltimore Green Currency as an organization raised the money as a way of responding to the Recession and the strain placed on local businesses. “When you go and buy something from Walmart, all that money leaves town,” said Michael Tew, an organizer with Green Currency. The money collected at exchance centers or what is formally known as Cambios ( Little Shop of Hardware, Capital Mac in Fells Point and Murray Blum in Hampden ) is put in a bank account backing the currency, according to the organizers. The idea, according to association members, is that the B-notes stay in use much like the dollar and so far few people have been cashing in Bs back to dollars. Rooted in the buy local, grassroots, sustainable movement, the B-note made its debut along the independent heavy neighborhood of Hampden and has since spread throughout the city. The Baltimore Note, artfully done with the Oriole Bird on Side A and Frederick Douglas on the other for the 1 B, and The Raven with the required portrait of Poe on the other for the Fiver follows the lead of other communities, There’s the Ithaca Hours or BerkShares in Berkshire, Mass or The Plenty in Pittsboro or Brixton Pound in London and of course Seatle, home of the World Bank Riots, came out with Local-Bucks. And now Baltimore Green Currency stands ready about the 100,000 in cash notes, 6,000 on the streets. You get the idea, progressives playing with money. But the economics benefits is very tangible and cross-cuts the community. “It gives you a real way to buy local and Baltimore as a community takes pride in that,” said Nichols. Still adopting a new currency was a bit much for some businesses owners to handle. One owner laughed at the idea that someone came into her store with the idea of printing their own money. “I’m still coming around to it,” she said. Others like Mickey Fried, owner of Belle Hardware in Bolton Hill, locked on to the political ramifications of creating local money. When asked to accept the currency he considered what would happen if he was inundated with the B-note. Would he be able to use it and of course there’s overall concern: What if the B-note fails.? “It’s a risk because if it fall flat on its face, then frankly we’ve basically given the stuff away,” he said. But Fried also had faith in Baltimore’s tight network of small business and likes striking back at the ever expanding move to bring in corporate stores where the profits leave the city for corporate headquarters. Jokingly called hippie money, the B-note has captured the attention of the usual suspects, small businesses people already rooted in social consciousness that these days has been translated in that over-used word – “Sustainability.”. But the real challenge is for the B-note to translate into the regular sector, where money exchange hands in crumpled bills in quick pace, basically a place like a famous deli on Lombard Street or a popular movie house on Charles Street or how about a baseball stadium off 395. The day the B-note gets in the hands of the apathetic spenders, the greater the change. The organizers know this and are pushing on with goals like having the city accept the B-note. Last week Mayor Stephanie Rawlings-Blake happily posed with a B-note. A sign of the future or bandwagon move by a politician. Sam Holden, The Gonzo light is out, but the fire burns on.